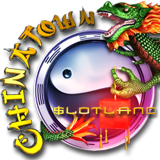 Continuing its ninteenth birthday party, Slotland has unveiled its new Chinatown slot game. The Chinatown slot, which brings the color and excitement of bustling Asian market streets to the unique online casino, is a 21 pay line real-money video slot with an expanding Wild symbol and chances to win up to 15 free spins. Until this Sunday, October 15, you can claim a $20 freebie to try the new game! And -- happy 19th birthday Slotland! 19th Birthday Bonuses, with various wagering requirements, are also available until Sunday. New Asian-themed real money online slot game has expanding Wild and free spins feature. Mouth-watering Chinese noodles, exquisite Lotus blossoms and antique Ming vases spin on Chinatown’s reels. The Sword of an ancient Chinese warrior is Chinatown’s Expanding Wild symbol. It can appear on any reel and when it does it covers the entire reel. Three or more glowing red Chinese Lanterns trigger up to fifteen free spins. With is wide betting range, the new real money online slot will appeal to all kinds of players. They can bet as little as two cents on one line or bet $4 on all 21 pay lines for a max bet of $84. Like most of Slotland’s games, Chinatown is tied to its site-wide progressive jackpot which paid out a record-breaking $315K this summer. On Chinatown, hitting five Bronze Buddha Heads, with a minimum $5 bet, wins the jackpot which is back up to over $110,000. 23X wagering requirement, 5X max. cash-out (VIPs 10X); valid for Chinatown only. 23X wagering requirement; can be redeemed twice on deposits of $50 and above; valid for slots and keno. 17X wagering requirement; can be redeemed three times; valid for slots and keno, mobile game play only. 14X wagering requirement; can be redeemed four times; valid for all slots and keno. 10X wagering requirement; can be redeemed twice a day; valid for all games. After adding several new games over the summer, good old Slotland now has more than 60 unique slot games. You'll find some at their other casino (WinADay Casino) as well, but most can only be played at Slotland.